2011 witnessed the 40th anniversary of the founding of English manufacturer Meridian and the partnership between electronics engineer Bob Stuart and industrial designer Allen Boothroyd. To celebrate Stuart and Boothroyd created anniversary editions of the DSP-8000 active speaker and 808 Signature Reference CD Player, of which only 40 of each model will be made. Bob Stuart looks suitably proud of the models, which are finished in exclusive “Ruby” finish—not available on other products in the range—even the drivers are treated with a new, polished bezel. Each system is signed by Stuart and Boothroyd, comes with a book illustrating Meridian’s history, and will be set-up in the customer's home by a Meridian engineer. 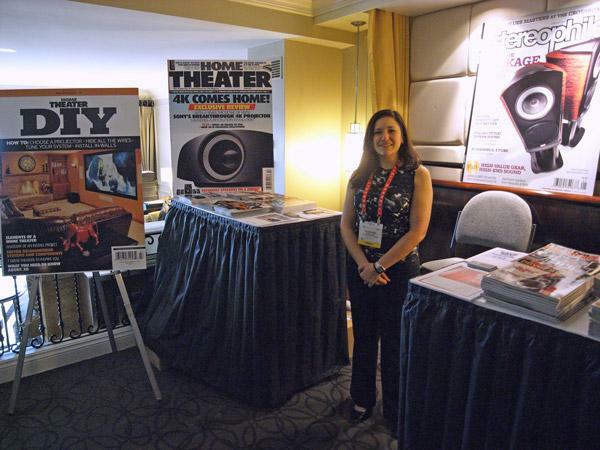 For several years now, the CES's High-Performance Audio exhibits have been housed at the tony Venetian Hotel on the Las Vegas Strip. And also for several years, the room shared by Stereophile and Home Theater magazines, now joined by our sister websites AudioStream.com and InnerFidelity.com, has been hosted by our administrative assistant (which means she is the glue that holds us together and tells me she prefers to be called our "Digital Goddess") Rosemarie Torcivia. Welcome to Las Vegas, Ro'. The first morning of CES is traditionally when Stereophile presents its awards for the best products of the previous year, voted on by the magazine's editors and writers. Here, in the magazine's suite at the Venetian Hotel, awaiting their recipients are the 2011 Awards. 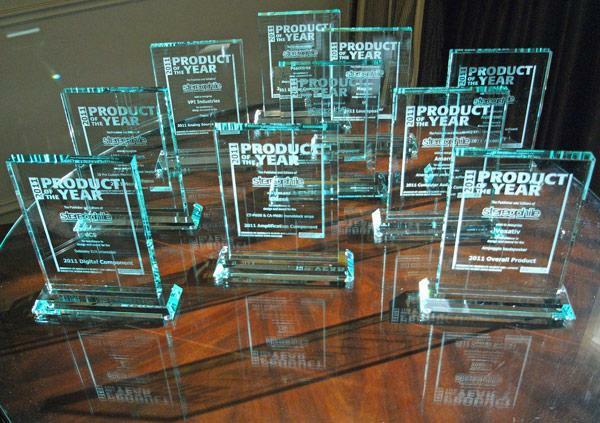 My thanks to Ariel Bitran for doing a great job getting the awards to CES in time for the presentations. 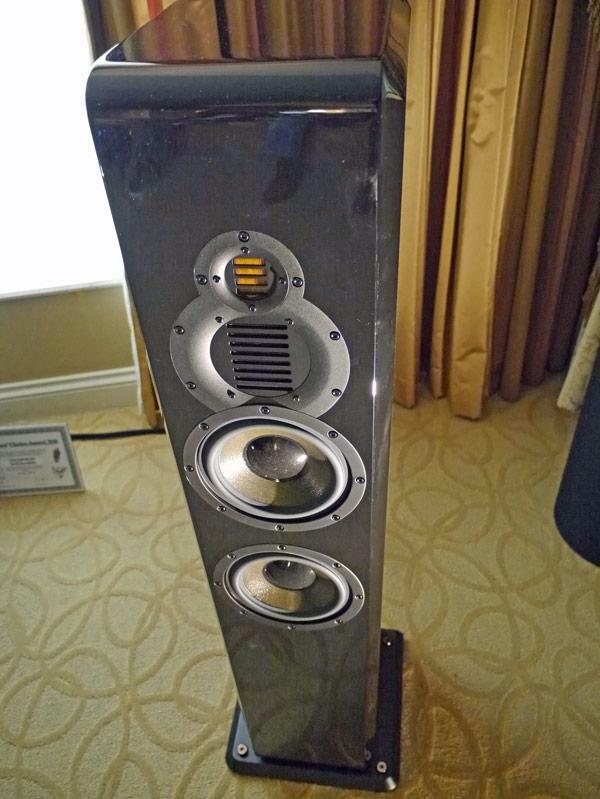 Checking out the Reference 3A speakers (Grand Veena, MM de Capo i, etc.) in Divergent Technologies' room at T.H.E. Show, I noticed that the center of the midrange and mid-bass drivers looked different. Divergent's Tash Goka was not in the room, but the person who was there introduced himself as the one responsible for the modification of these drivers. He's Ricky Schultz, inventor of the Surreal Acoustic Driver Lens, a small plastic device that is glued to the drive's dustcap, and has the effect of broadening the dispersion. 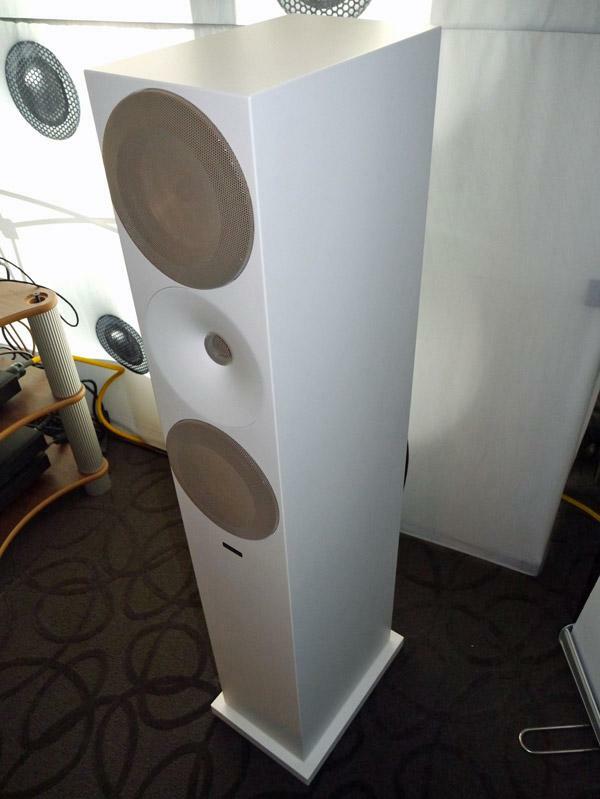 The Surreal Acoustic Driver Lens is being incorporated into the production of all Reference 3A speakers. It's an OEM product, not available to consumers, and, according to Schultz, it has the potential to improve the performance of many loudspeaker drivers. He proceeded to provide me with the explanation of how the device works, but it quickly went over my head. The Adam is yet another loudspeaker manufacturer that uses drivers that are descendants of the Heil AMT tweeter. Adam's Classic Mk.3 uses what they call Accelerated Ribbon Technology (X-ART) for the midrange as well as the tweeter, and 2x7.5" HexaCone midwoofers. The Classic Mk.3 is available in passive ($7000)/pair or active ($10,000/pair) form, the latter for the studio professional market. 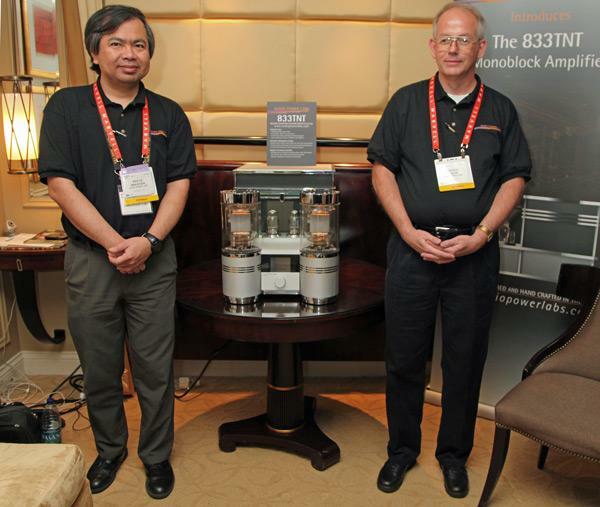 A brief demowith Cary Audio electronicssounded convincingly full-range and dynamic. 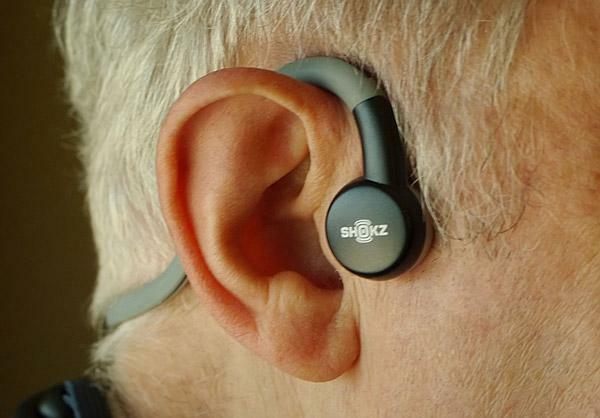 I understand that Kal Rubinson is getting a pair of these for review in Stereophile. Shown above is the new Pandora DAC which has three slots on the back for a variety of input options including AES, USB (asynch) and SPDIF, and tube analog stage and both balanced and unbalanced outputs and an optional volume control. Retail is $6k. Although I don't consider myself an expert on headphones by any means, I know that they fall into three basic categories: (1) circumaural (pad around the ear, the back closed or open) (2) supra-aural (pad on the ear), (3) in-the-ear (tightly or loosely fitting). (There were also the Jecklin Float headphones, which involved a pad on top of your head, with the transducers being positioned some distance from the ears. These have never enjoyed widespread success, and I don't think they're being made any more.) 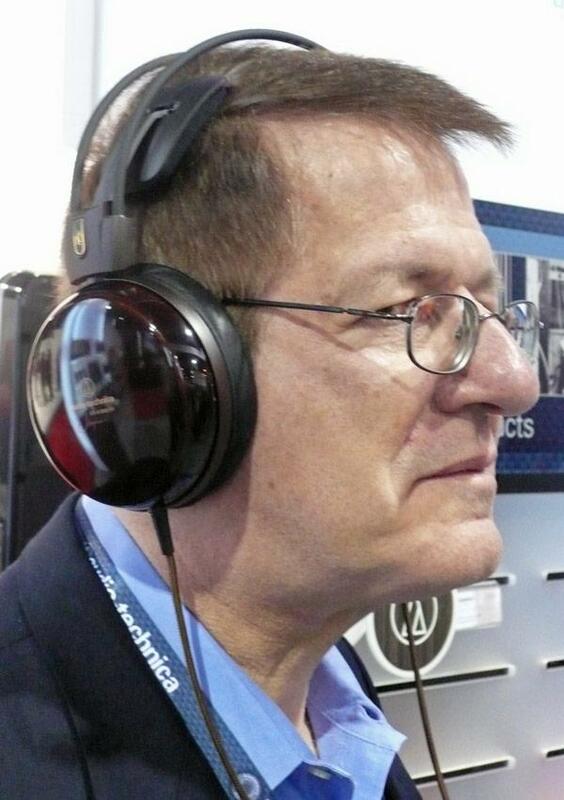 However, I was intrigued by one of the pre-CES emails, announcing "ear-free" headphones. Stephen Mejias has written about Anssi Hyvönen of Amphion, who believes that music reproduction doesn't have to be loud to be effective, and that, in fact, the hallmark of a really good speaker is its ability to be involving at low levels. 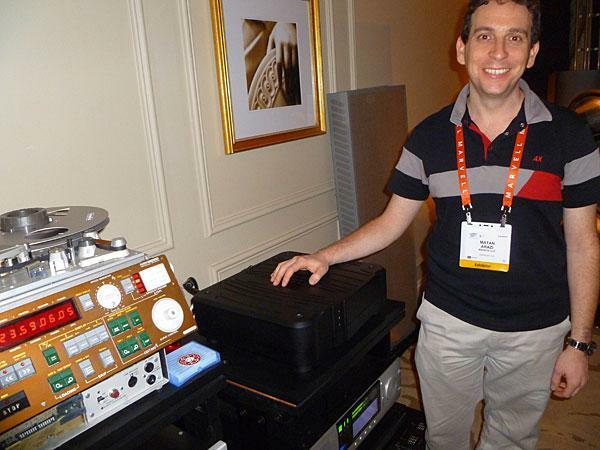 Amphion's demos always provide for a soothing experience at shows, and so it was at CES 2012, this time using the new Argon7Ls ($5999/pair) with Nuforce electronics. 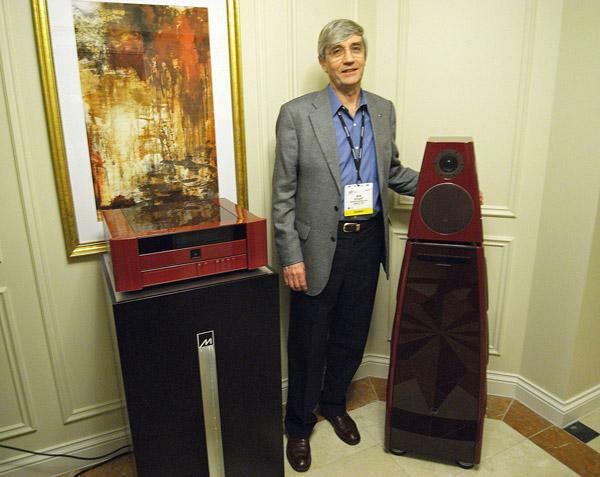 Pass Labs’ engineer Wayne Colburn insisted that the name of their latest amplifier, the Xs, was not a pun. 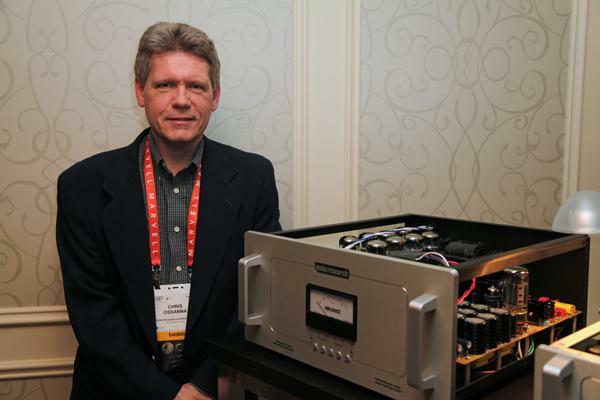 He spent over an hour detailing the 3-year design project that culminated in the company's $85,000/pair, solid-state, two-chassis-per-channel, class-A amplifier. Leaning on the 4.5-foot stack of the amplifier's stereo configuration, Wayne spoke about how the design was based on the results of an examination of transfer characteristics of a diverse set of gain devices, including tubes and SITs (silicon-carbide devices that are exclusive, we believe, to Pass Labs for use in audio). 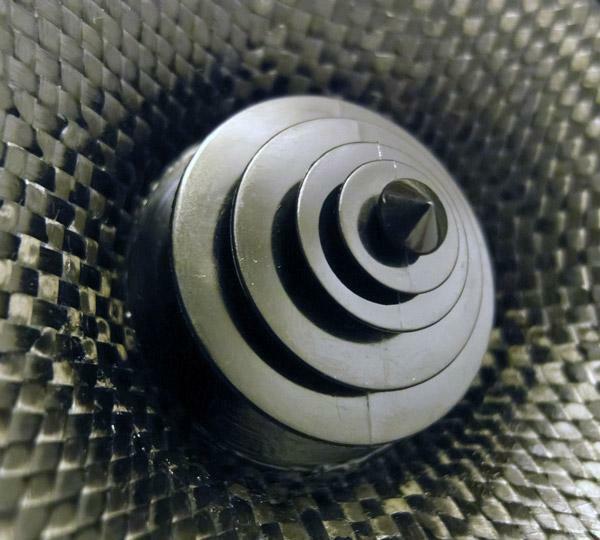 The output stage was designed to reproduce the transfer characteristics preferred by a panel of listeners, who lived with a variety of different output stages for a lengthy period of time. 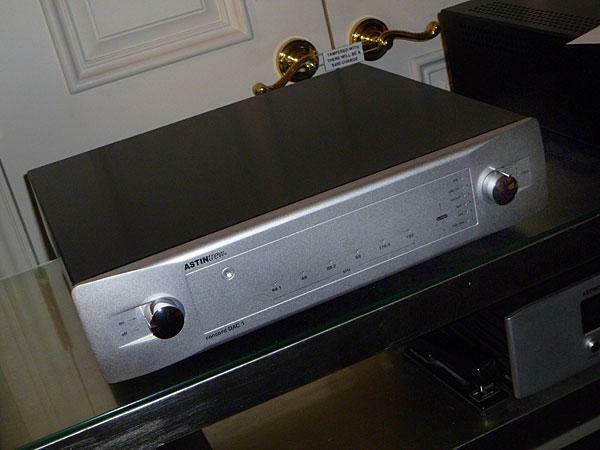 UK manufacturer Astin Trew had their new DAC 1 on display. Managing Director Michael Osborn was on hand to answer questions and look for US distribution for his products. The DAC 1 features asynch 24/192 USB as well as FireWire and I2S inputs. It has a 6922 buffered tube output stage for single-ended connections and solid state for balanced output. Price should be around $4,500-$5,000 and would arrive in about 2 months once distribution is set up. A music server priced in the low six figures. An air tight music server filled with inert gasses. 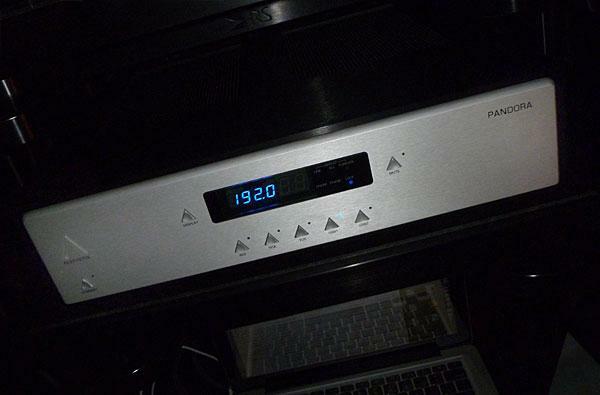 A music server so rare, only two have been built to date. I try to be logical about show coverage so usually start at the top floor and work my way down, room by room, floor by floor. CES exhibits at the Venetian top out at floor 35, and as soon as I exited the stairwell, I spied the first exhibitor, Magico speakers. I'm here to cover digital and tend to skip the speaker-only rooms, but Magico provides great demos, so I stepped in. I'd file this one under DAC/preamp/streamer, with plenty of features and more to be announced. What we know: based on the company's DAC 8, there will be six digital inputs including all the usual suspects as well as wired and wireless networking, vTuner and UPnP. The DAC can upsample to 24/192 and includes a front panel display for control info and selected meta-data via DLNA/UPnP networked devices. Price will be around $15k. 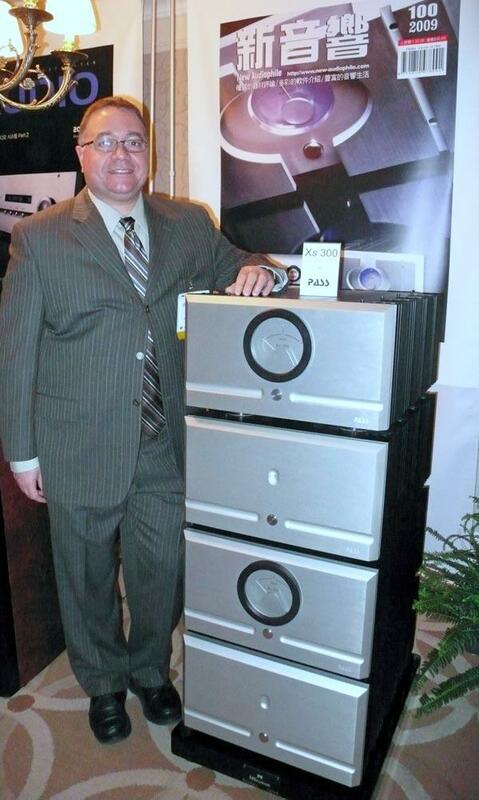 Audio Research's Chris Ossanna proudly shows off the company's new $25,000/pair, two-chassis Reference 250 monoblocks, which employ the new KT-120 output tube. 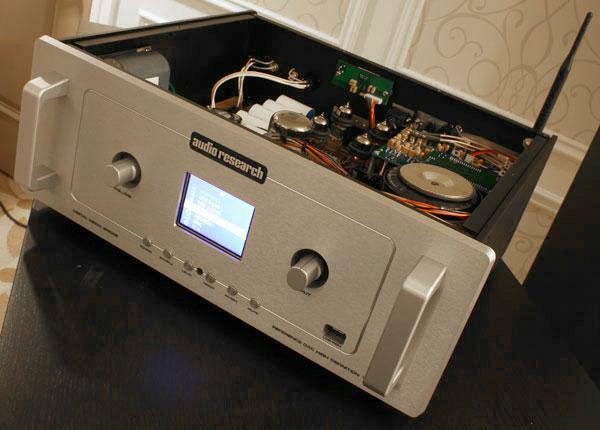 This amplifier has 50% more power-supply capacitance than their previous flagship, the Reference Anniversary 110, and uses the same type of Teflon coupling capacitors they sourced for their Reference Anniversary preamplifier. The front panel metering allows the consumer to check the bias and to adjust the speed of their response to either fast or slow. Audio Technica's PR rep Frank Doris models the company's limited-edition, $1299.95, ATH3000 headphones, that feature Echizen wood frames, 53mm drivers, Spanish lamb wool cushions, and 7x9s copper wire.